Seems to be lots of them around here. New site. New apartment. I got my haircut yesterday. Tomorrow, I start a new job. A new job! Sort of. It’s an internship. But haven’t you heard? Internships (especially ones that are unpaid) are the new black. Mine is an internship at one of the coolest magazines on the block, one that features food and drinks and travel and food and food. I’ll be working in their test kitchen, fiddling with recipes and sourcing ingredients and measuring things so precisely you’ll want to slap me in the face. I couldn’t be more excited. Changes like these, I think, call for cake. Don’t you agree? This cake is simple and to the point. 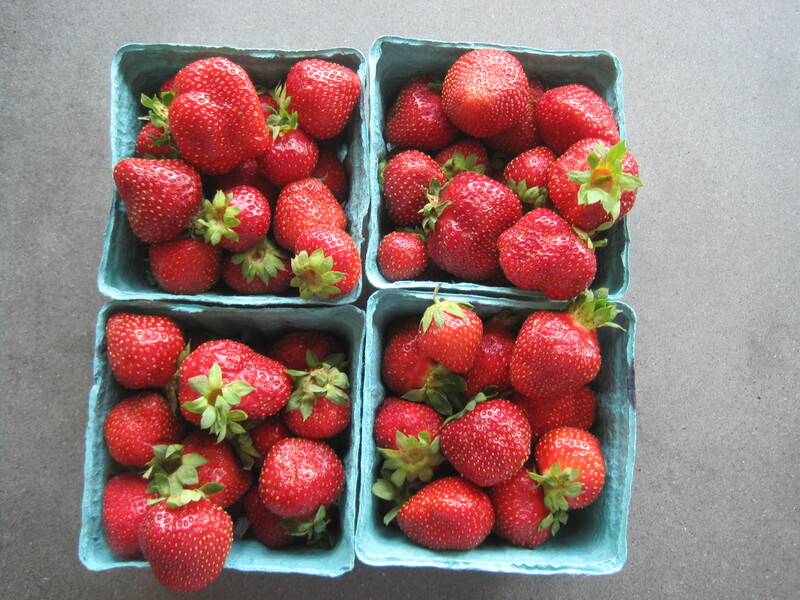 It’s a beautiful way to use up the 4 cartons of strawberries you bought at the market because they looked like gems and smelled like heaven alive. 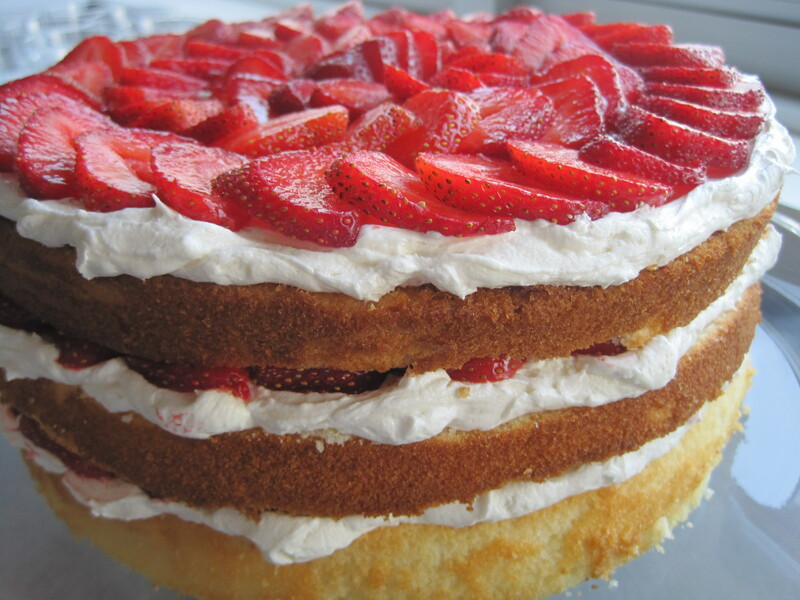 Yellow cake, sweet cream, strawberries. Repeat. Not a bad change, if you ask me. This is Deb from Smitten Kitchen’s yellow cake recipe. It’s fantastic. Preheat the oven to 350 degrees and butter a 9-inch round cake pan. In a bowl, whisk together the flour, baking powder, baking soda, and salt. In a separate bowl, cream together the butter and sugar until light and fluffy. Add the eggs, one at a time, until fully incorporated. Next, add the vanilla and scrape the bowl to make sure everything is mixed well. Add the buttermilk, mixing slowly, until just incorporated (batter will look curdled). Add the flour mixture in two batches, mixing until everything is just combined. Spread the batter into the prepared cake pan and bake until golden and a toothpick inserted into the center of the cake comes out clean, 25-35 minutes. Cool in the pan on a rack for 10 minutes, then invert the cake onto the rack and cool completely, about 1 hour. While the cake is cooling, slice your strawberries and prepare whipped cream. In a large bowl, begin to whip the cream with a whisk or electric mixer, until you can see it begin to thicken. Add the sugar and vanilla and continue whipping until it holds medium peaks. Be careful not to over whip your cream, or you’ll get little chunks of butter in what you want to be a smooth and creamy filling. Use a large serrated knife to carefully slice your cake in thirds. (For a good cake-slicing demo, check out Zoe Francois’ excellent tutorial). Transfer one of the cake rounds onto your serving plate, and then spread one third of the whipped cream on top. Arrange a layer of strawberries on top of the cream. Repeat with the next layer of cake, and work your way up to the top. 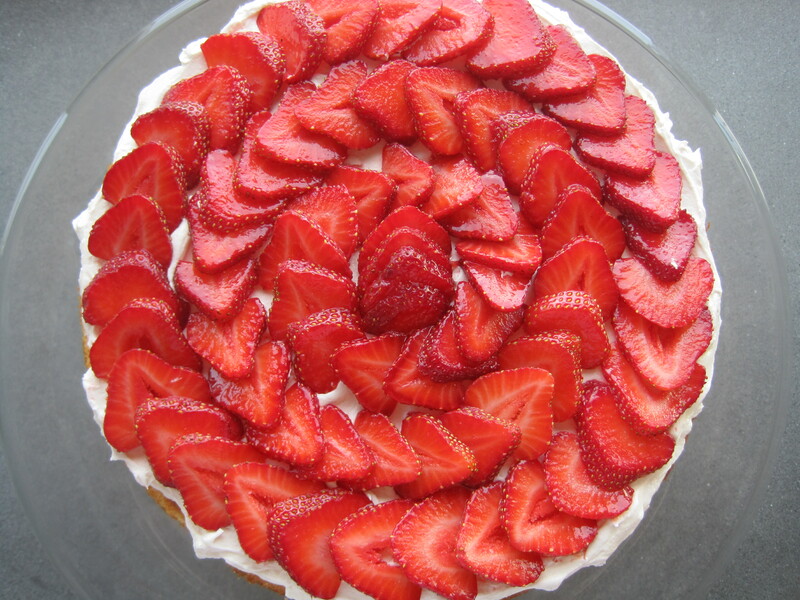 To make a pretty strawberry pattern, lay overlapping slices in concentric circles, starting from the outside of the cake and working your way to the center. Serve immediately. Possibly with lemonade. yum! and what GORGEOUS photos! That’s the prettiest thing I’ve seen all day.